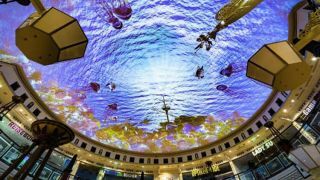 After two years design and planning, two months of installation and two weeks of setup, Das Schloss shopping center in Berlin unveiled a new AV Stumpfl installation that projects an ocean view onto the ceiling. F1 Gesellschaft für Informationstechnologien und Managementberatung mbH, working in collaboration with VIOSO GmbH, installed 15 AV Stumpfl’s Wings VIOSO software packages for calibration and projection mapping, 15 Wings VIOSO servers for playback of high-resolution content, Wings Touch for simplified operation and Wings Avio Manager for system control and communication between system components. F1 Gesellschaft für Informationstechnologien und Managementberatung mbH designed the installation with longevity and return on investment in mind. Now Das Schloss has an ‘underwater’ theme inspired by the brand new multimedia content designed by artistic collective Werft 6 GbR in Dusseldorf. A total of 78 Barco F32 video projectors are controlled by 15 computers, projecting an underwater scene of coral, schools of fish and even mermaids along three circular areas of a 1,200 metres squared ceiling as the people below go about their shopping sprees. The entire projection canvas is about 16K by 16K square pixels and is in a curved L-shape. The projected images for the ceiling of Das Schloss utilizes the patented auto-align warp and map feature of AV Stumpfl Wings VIOSO. 2 cameras were used to automatically determine the warping & blending of the ceiling. Thus, the watery landscape at Das Schloss is uncompromised. Wings Touch is a Drag & Drop Editor that can easily create and edit user interfaces - from background layouts to designing and connecting controls - and can run from any device such as a smartphone, tablet or touch device. Wings Avio Manager can combine software and hardware tools that would usually have come from different manufacturers. It offers all the required tools for arranging video, text, images and audio into one show.